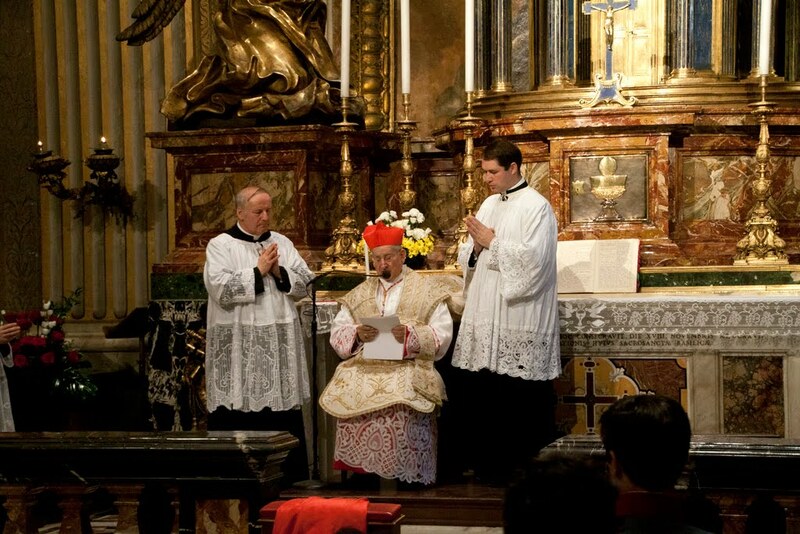 Continuing on with our coverage of the FIUV (Una Voce) general assembly in Rome which took place this past November 2011, an item which some of you may or may not have seen already was the Mass celebrated in the Blessed Sacrament Chapel of St Peter's Baslica, celebrated by Cardinal Castrillon Hoyos. I greet Mr. Leo Darroch, President of the International Federation “Una Voce”, the delegates of the XXth General Assembly, and all the faithful here present. I am particularly grateful to President Darroch and appreciate the invitation to celebrate this sacred rite that takes place four years after the promulgation of the Motu proprio Summorum Pontificum of His Holiness Benedict XVI. I am truly glad to be here among you to express profound thanks to the Divine Providence that never fails to succour His children who hopefully invoke Him. At the same time we show our sincere gratitude to our beloved Holy Father Benedict XVI who, by his far-sighted pastoral solicitude, has given back to the universal Church the sacred Gregorian Rite, with a renewed blooming after many years of oblivion. 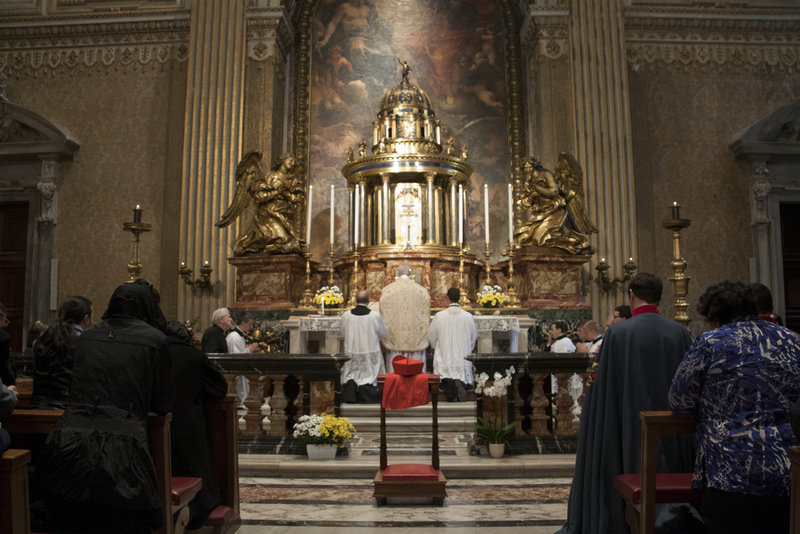 It is known, in fact, that the Latin liturgy of the Church in its various forms, in each century of the Christian era, has been a spur to the spiritual life of many saints, has reinforced many people in the virtue of religion and fecundated their piety”. It is in obedience, deference and respect to the Teaching of the Church, and especially to the Supreme Petrine Teaching, that the ultimate purpose of the sequela Christi comes true in the life of every believer. In this way, a proper understanding of the duties and rights of the faithful, who find a more eloquent form of expression in the sacred liturgy, embeds itself, expressing true worship to Almighty God, Creator and Lord of the universe, with the sanctifying strength of the sacramental action. This relationship between creed and worship is evidenced in a particular way by the rich theological and liturgical category of beauty. 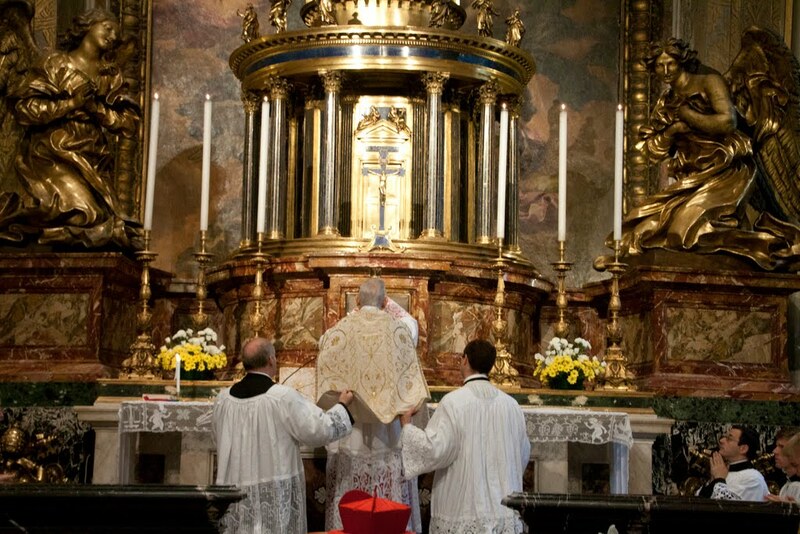 Like the rest of Christian Revelation, the liturgy is inherently linked to beauty: it is veritatis splendor. The Gregorian Rite, with its solemn and sublime content, undoubtedly constitutes an excellent form of raising up to God the praise we owe to Him, while at the same time giving the faithful a deeper insight into the Mystery that is celebrated. Such magnificence is not simply due to a sum of external elements of pure aesthetic nature, but springs from, and feeds on, a deep interiority. We can affirm that in this way the duty of offering up to God adoration and praise to His Majesty in the most appropriate manner conforms with the right of the faithful to best express their desire to act on this duty. When listening to today’s passage of the Gospel according to St. Luke, we must not be surprised if to the praising words of the woman of the people about the Mother of the Saviour – “Blessed is the womb that bore thee…” (Luke, 11, 27) – He replies by reminding them that blessed are they who are obedient to the Word of God. Indeed, by reasoning in this way, Our Lord Jesus does not distance Himself from the praise being addressed to the Blessed Virgin; He instead strengthens it by emphasising the excellent virtue of total oblation that shines in Her more than in any other being, to the point that this marks the dawn of human redemption. At the same time, He reminds us that the Blessed Virgin has been chosen by the Holy Trinity as an example and guide to those who set nothing above eternal salvation; it is precisely by imitating the faithful obedience of the Mother of Fair Love that our obedience as wayfarers in search of God finds a safe path which leads us to the Supreme Good. We can say with confidence that obedience to God comes through obedience to Mary, such that the sincere devotion of so exalted a Queen has eloquently expressed a predilection for those who have understood this commendable spiritual secret. (St. Louis de Montfort: Treatise on the True Devotion to the Blessed Virgin, n. 200). The unique summary of all virtues with which the Divine Wisdom has adorned the Most Blessed Virgin is the reflection of the incomparable humility that has made Her the Sovereign of grace and the Mother of Mercy at the side of the Divine Heart. The obedience of the Blessed Virgin is the perfumed flower blossomed in the furrow of this unfathomable humilitas of Her, that softly inebriates every soul wishing to pay homage to Her and to ask for help and patronage. When calling Mary ‘Mediatrix’ I have intended to call Her so only as Mediatrix of Grace, unlike Jesus Christ, who is the first and sole Mediator of Justice. When calling Mary ‘Omnipotent’..., I have intended to call so as far as She, being the Mother of God, obtains from Him with Her prayers whatever She asks in benefit of Her devotees… When calling Mary our ‘Hope’, I have intended to call Her so because all graces (as Saint Bernard says) pass through Her hands”. Some have these commandments of God in their heart, by remembering them and continually meditating on them … But this is not enough unless they are kept in one's actions… Others have these commandments on their lips, by preaching and exhorting … They also should follow them in their actions… Others have them by hearing them, gladly and earnestly listening to them… Yet this is not enough unless they keep them in their actions. If it is true that the worship which is most acceptable to God is the one of adhesion to His holy will, at the same time one cannot escape the extraordinary importance of external worship, with the Sacred Liturgy being the preferred means of fulfilment. 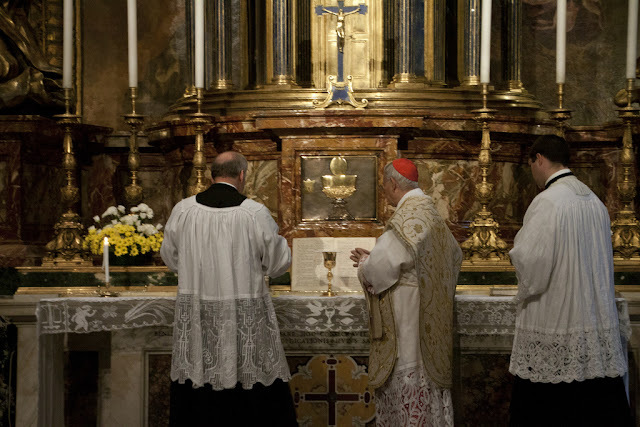 The widespread practice of liturgical abuses during the post-conciliar years has caused deep wounds in the Church by discrediting the pre-eminence of that spirit of obedience to the Teaching of the Church that should unfailingly characterize the expression of the faith. 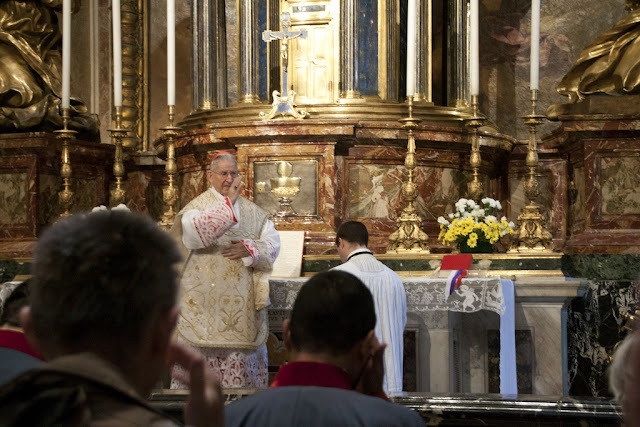 The ars celebrandi is the fruit of faithful adherence to the liturgical norms in all their richness; indeed, for two thousand years this way of celebrating has sustained the faith life of all believers. We know how the so-called “spirit of the Council” constitutes for some an instrument for espousing spurious claims which started to attract ways of thinking and acting which are cause for great concern. These people make themselves responsible for dangerous theological-pastoral drifts that positively damage the life of faith of the people of God. Sacred Liturgy, in particular, is often the object of arbitrary interpretations that distort its nature and aims, and cause suffering and disorientation to the christifideles (faithful), who become astonished observers of practices marked by weird forms of exasperated inventiveness. In this auspicious and relevant day for your pious society, arising from love of Jesus and His Church, we offer up our prayers so that the voice of the Vicar of Christ will be listened to and loved by all people. We plead with the Holy Mother of God, the humblest and highest being, our feelings of humility and obedience that God requires from devoted souls, so that our entire life may be a liturgy of praise in the joyful fulfilment of the divine will. 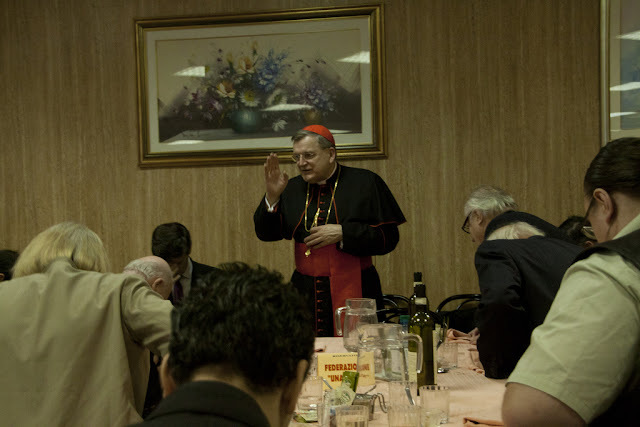 At the lunch following, the FIUV general assembly were joined by Cardinal Burke.